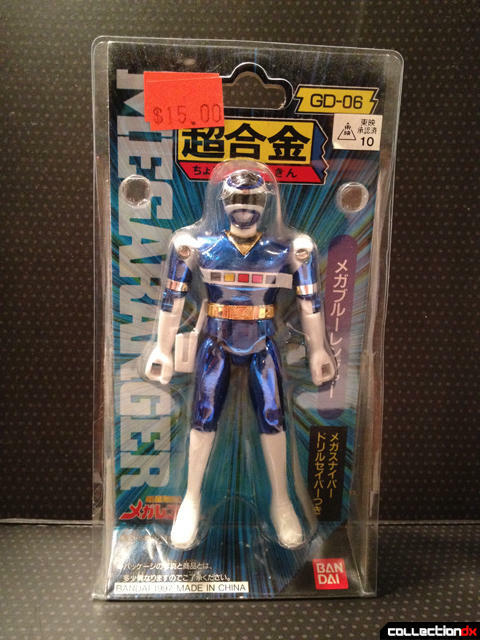 "Denji Sentai Megaranger (電磁戦隊メガレンジャー Denji Sentai Megarenjā?, translated into English as Electromagnetic Squadron Megaranger) was Toei Company Limited's 21st production of the Super Sentai television series whose motif was cyberspace and digital technology, both of which were considered revolutionary concepts during its premier. 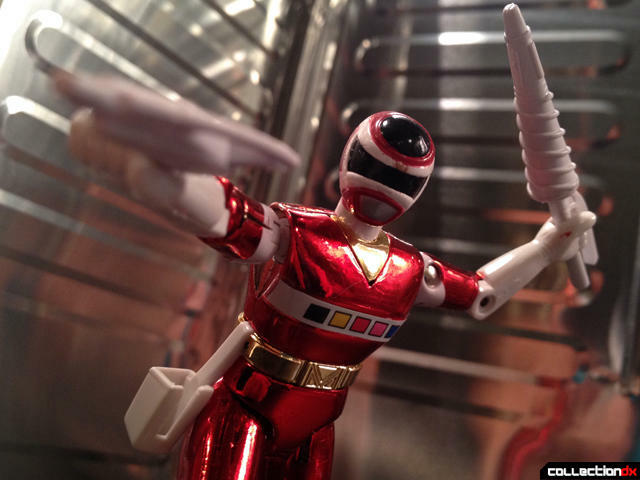 The footage was used in the American series, Power Rangers in Space." 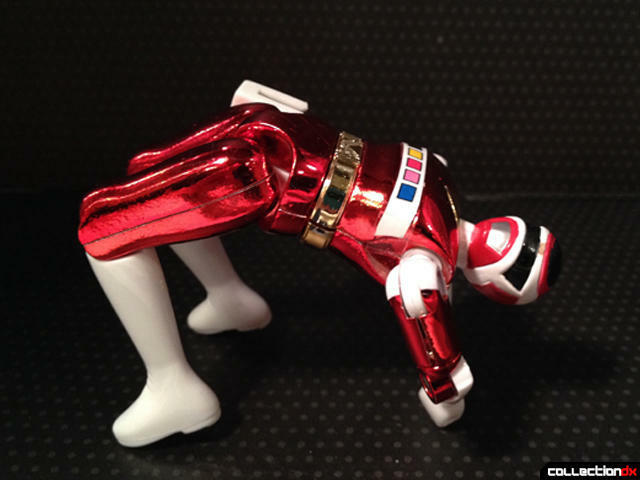 I have been on a big power rangers/super sentai kick lately. I was in high school when Power Rangers hit so I was a little too old for it, but still watched it a bit, and like everyone else I kinda dug the green ranger and his dragonzord. I saw the first movie and was disappointed with the actors being different than I remembered from the show, but as least Tommy was still there. 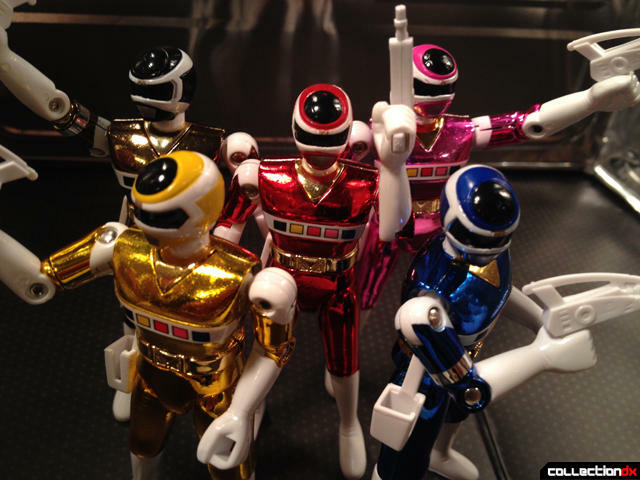 I also watched some Zeo when my little brother was old enough that he got into them. 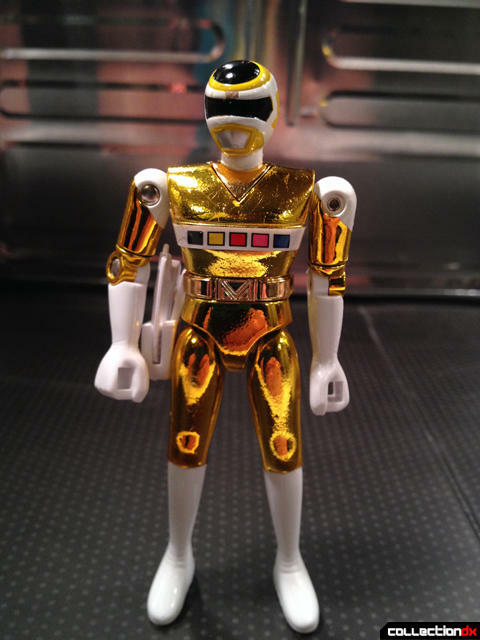 Then I didn't think to much about the Power rangers. 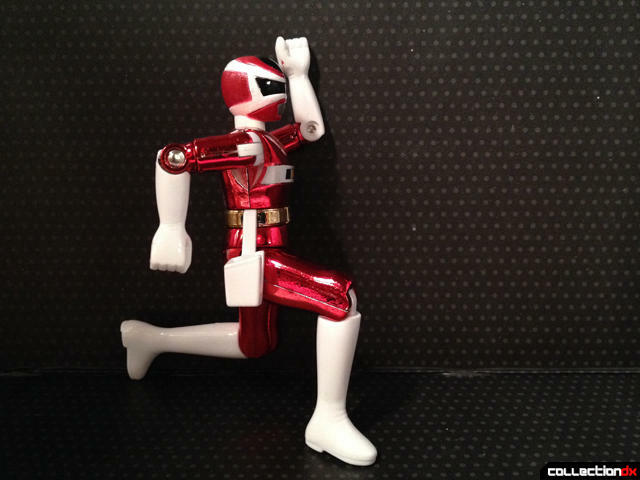 Cut to SH Figurearts release of the Green Power Ranger. I didn't buy it for a while since I didn't feel like I was enough of a fan to justify it. But when my awesome wife eventually got it for me, I was thrilled. 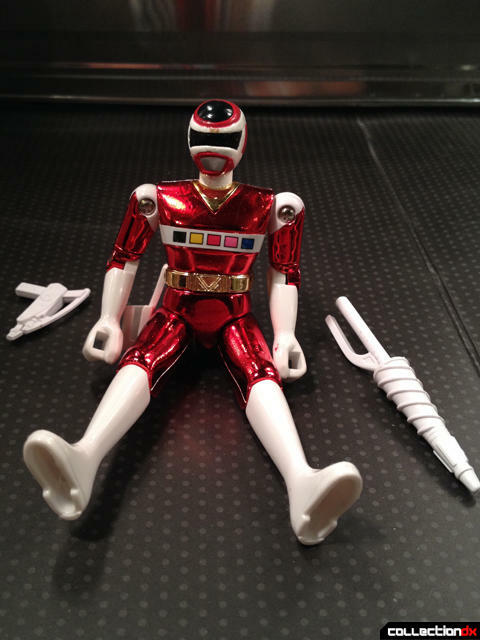 started re-watching MMPR on Netflix,with mixed enjoyment. Which led to watching all of the Japanese source material Kyōryū Sentai Zyuranger,(again thanks to Quelyn the awesome wife), which I loved. 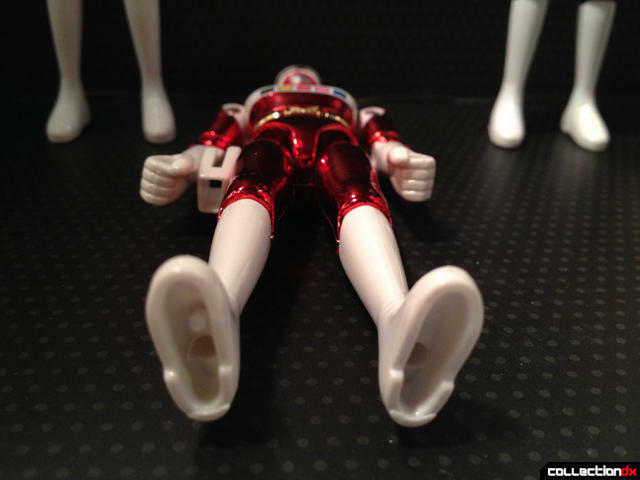 I have since started watching Himitsu Sentai Gorenger and Power Rangers Samurai. Recently Pellek released a mega mix of all the Power Rangers themes which we have been listening to obsessively. 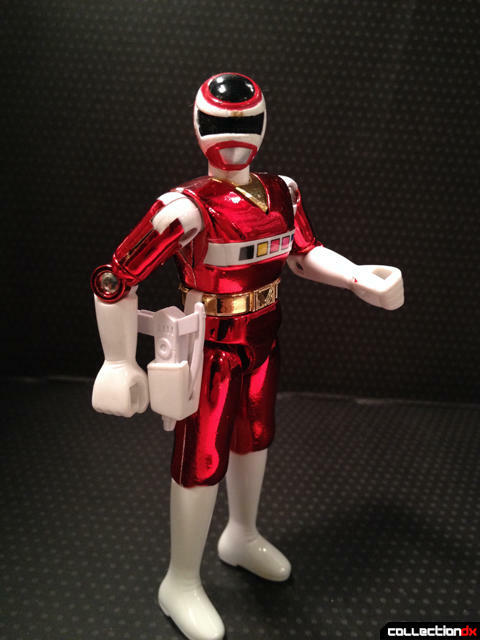 The notable differences is that Silver had golds bands around the gloves and boots, a different chest sticker, different weapons, and no holster. OK so enough history, on to the actual figures, I decided to review them all at the same time, since they are nearly identical. The best part is that they are re-sealable with 2 little push tabs on the top. But, that does make me wonder how you can truly know if they have ever been opened before? They are numbered GD-04 through GD-08. I know Silver is GD-09, No idea what GD-01, 02, and 03 are though. 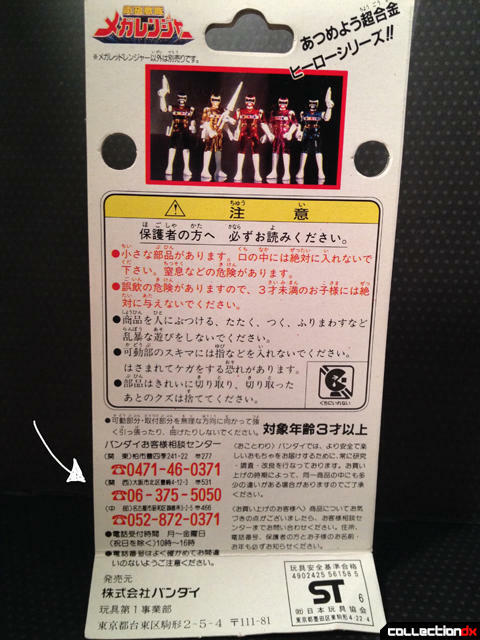 On the insert are 3 numbers to call, why? 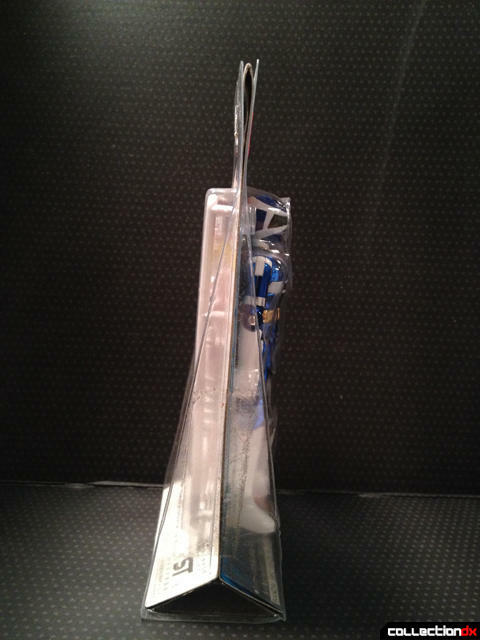 A contest, a warranty, poison control if ingested? 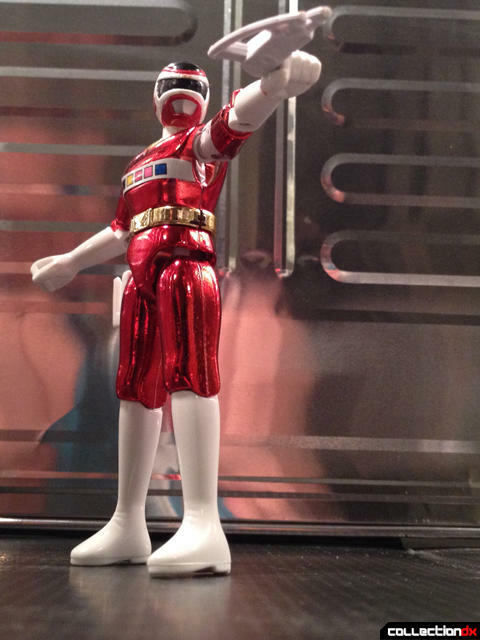 My Japanese is not sufficient to deduce the truth, but I suggest you all call and shout "GO GO POWER RANGERS!" The person on the other end is sure to appreciate it! 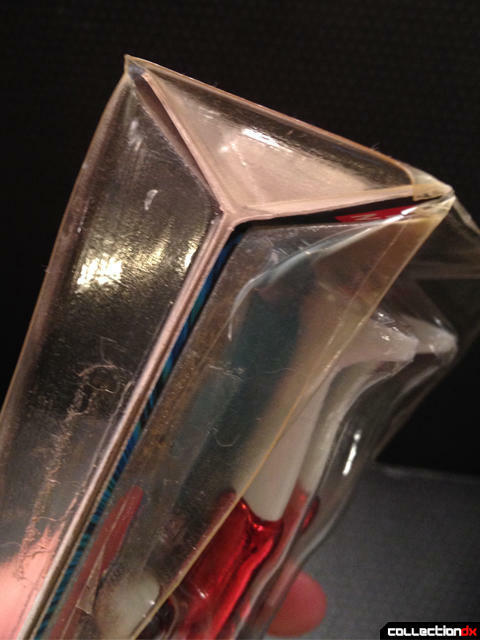 The packaging is not much to look at to begin with, mine are yellowed and dusty, and have tape residue on the sides. 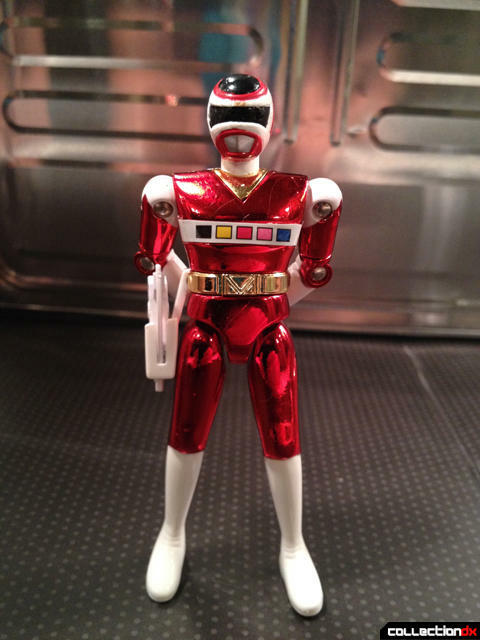 I opened Red first and so he will represent the rest for most of the review, which seems appropriate for a team leader. He has some big screw holes on the back, they have smooth metal circles on the fronts of the arms, which would have been nicer if painted, but otherwise don't bother me too much. The thighs, torso, shoulder and biceps are all metal. 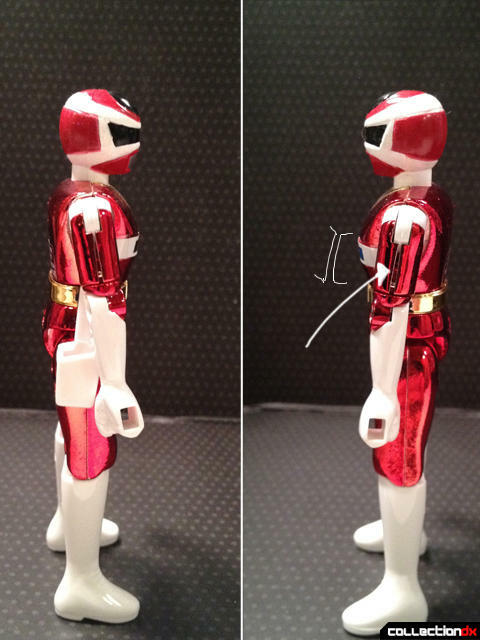 One thing I noticed right away is that the bicep pieces are coming apart at the seam, it's common to all the figures it seems, and worsens the more you rotate that joint. None have broken however, and you can push it back together fairly easily. Also the paint apps are very average, the insignia on the mask is not quite centered on some, and there were a few other flaws. 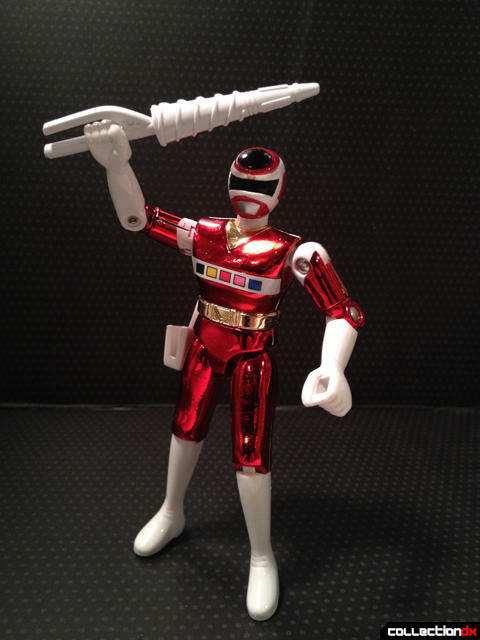 The articulation is pretty good for low-price point metal kids toy from the 90's. 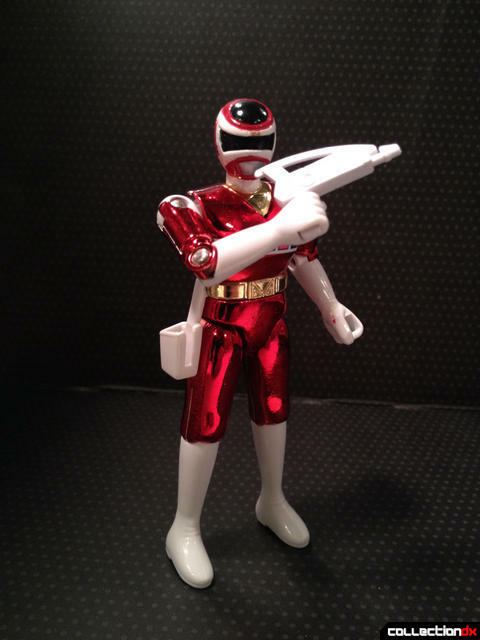 It even has the bicep swivel some modern figures lack. I wish it rotated at the waist though. 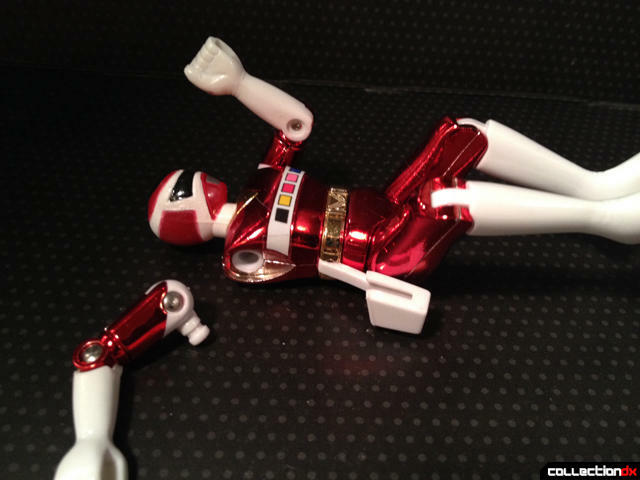 When I first picked up red to pose him, I grabbed him by the head so as not to smudge his finish, and the head popped off. 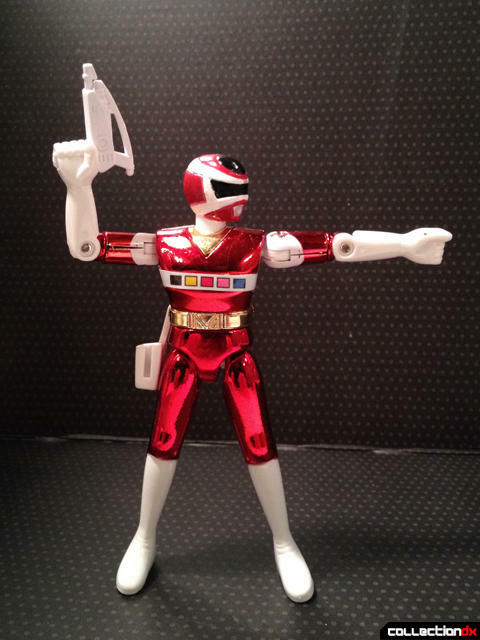 Later, when posing the arms, the arm popped off. Both went right back on but seems like bad design choices, if they come off that easy. 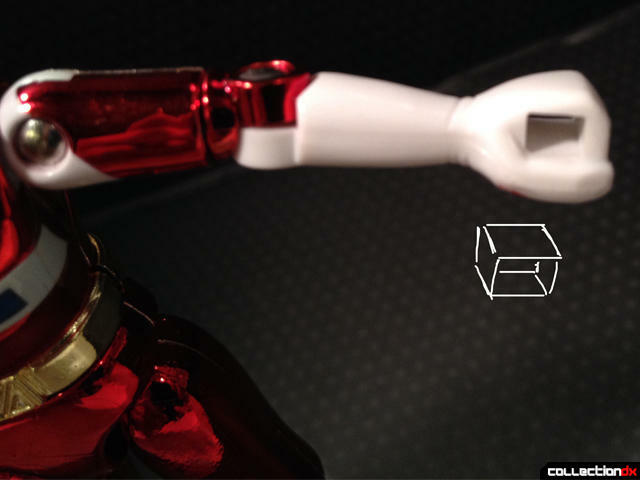 Both the head and shoulder joints are of a softer plastic than the gloves and boots. Here is a solo shot of each team member. Blue is really sharp and the one that I first noticed, but Pink might be my favorite, in terms of the way it catches the light. Black is a little closer to gold, and my least favorite, I originally thought it had faded with time, but others I have seen look the same. 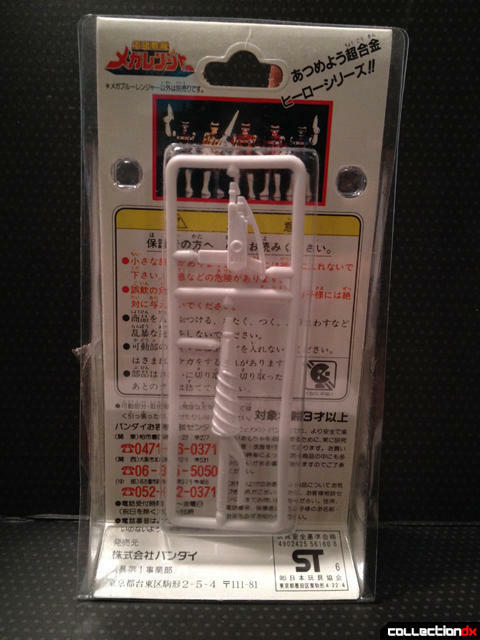 Each figure comes with identical weapons on a sprue. 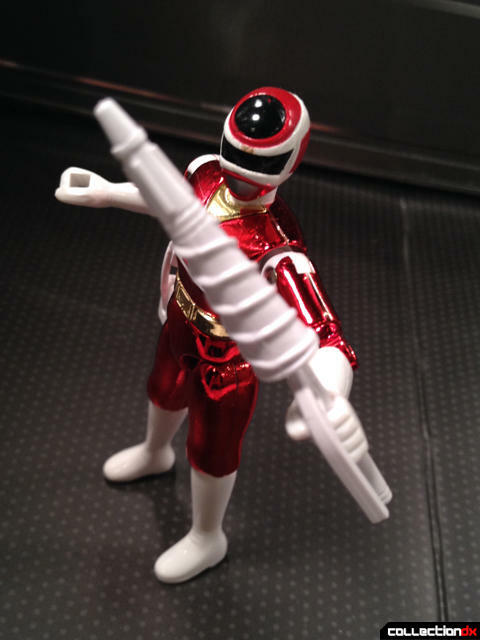 One Astro blaster/Mega Sniper (gun) which all the rangers had, and one Spiral Saber/Drill Saber (sword),which I belive only Red is supposed to have. They cannot fit together or combine in different ways like on the show. 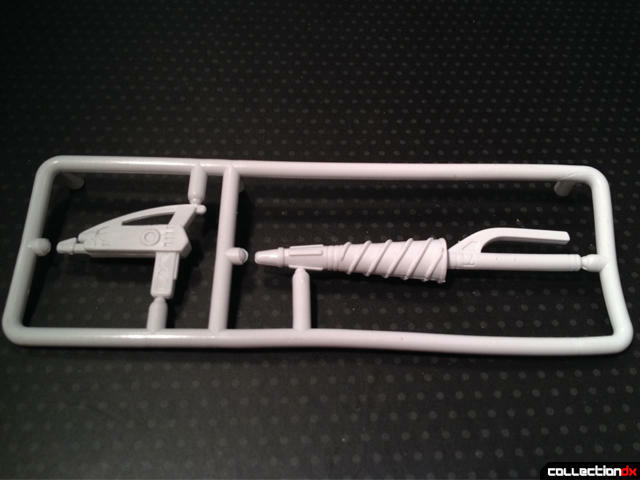 They are not painted or detailed, but come off the sprue easily and cleanly. The weapons have rectangular handles which fit the hand holes perfectly. The gun fits nicely in the holster and stays there, although the arm cannot go completely down to the side because of it. 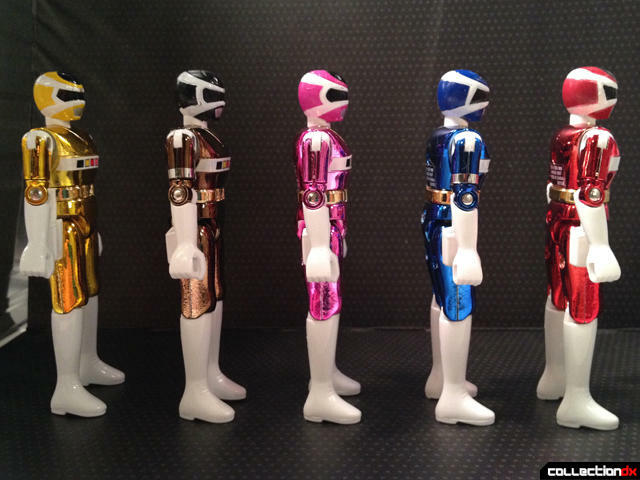 The molds on every thing but the heads are identical for all 5 figures, even the girls who have skirts in the show. 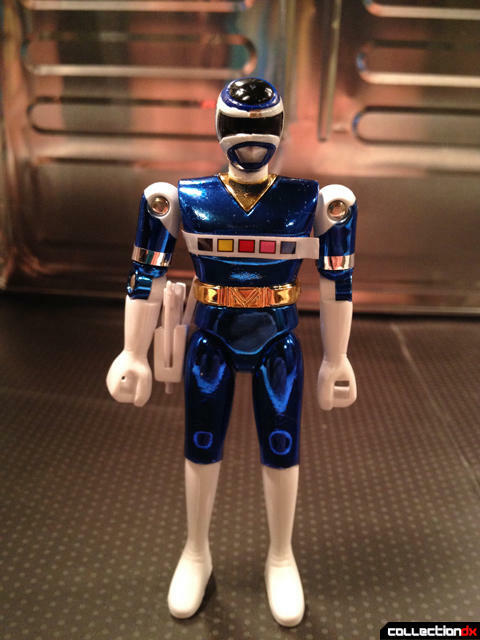 Blue and Black have silver armband stickers. The chest stickers are the same on all of them. 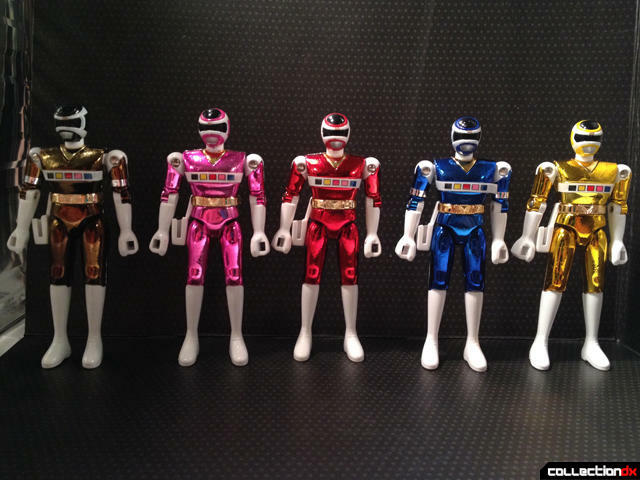 You can see the slight helmet design variations are the only real unique parts. in addition to the other issues already mentioned all the chest stickers are peeling off at the sides. This may be due to age, poor storage, or just they way they are made. Also of note, there seem to be tiny pieces of clear tape on the stickers to help hold them on, (only somewhat succeeding). Were these put there by the manufacturer, or is this proof someone owned and opened these before me? 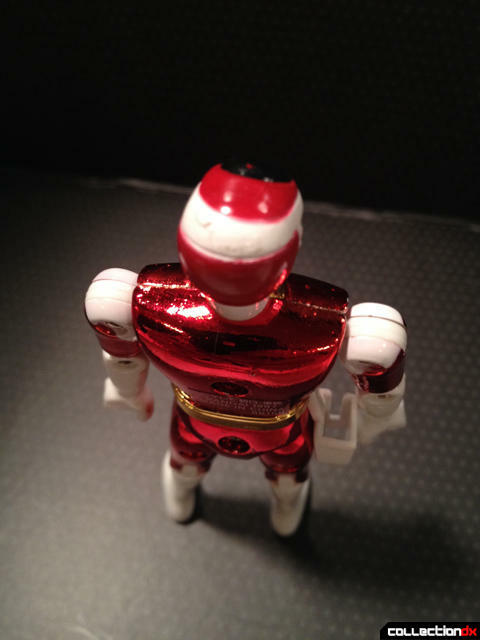 The loose figures I looked at all had noticeable cracks in the chrome finish. Upon closer inspection of mine you can see the beginnings of hairline cracks on all of them. 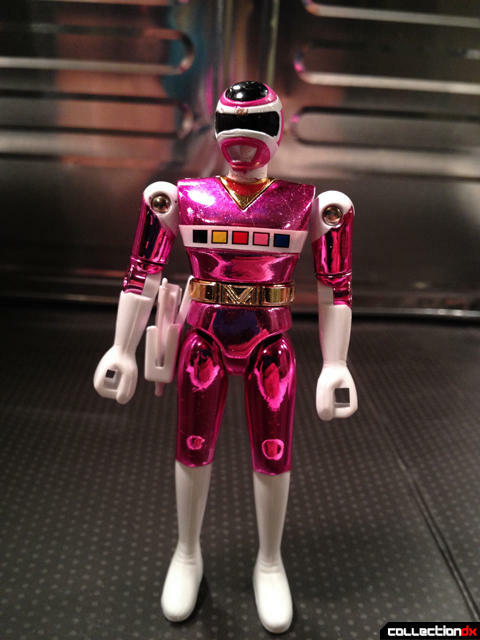 When my pink ranger head popped off it rubbed off some neck paint as well. 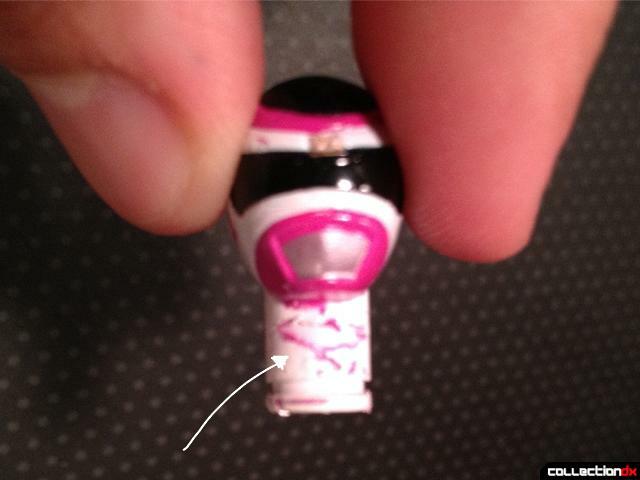 It seems like a white plastic part painted pink, and then white pained over the pink, it was really thick. 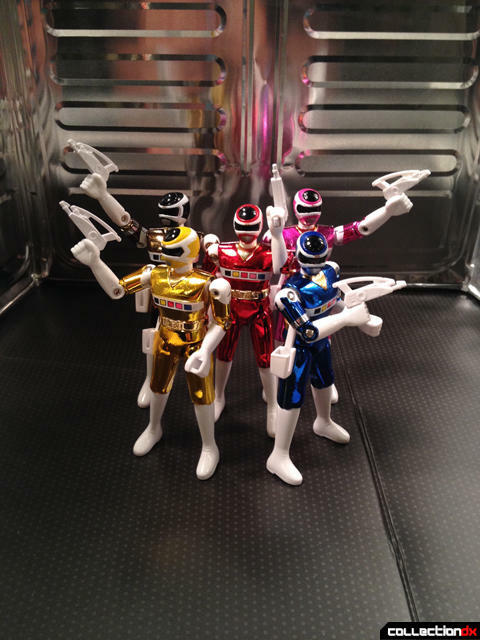 OK, forget all the bad stuff for a second they look great posed as a team! And here they are on my shelf in their final home. 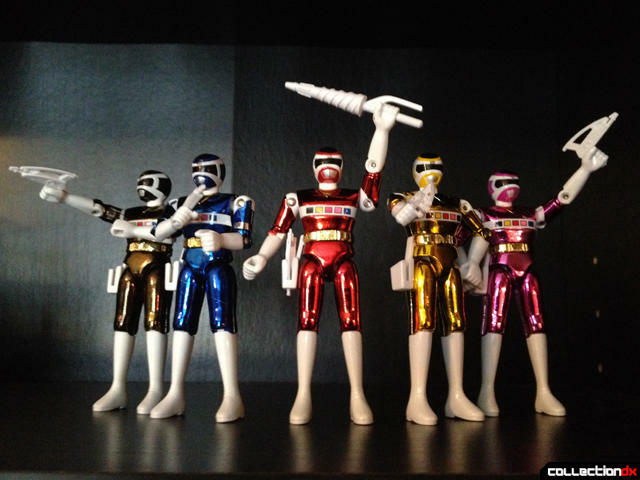 Overall these figures are some-what poorly made, but can display very nicely. It's surprising to me they were made for kids, since they fall apart so easily, and the stickers and paint are so weakly done. However, they do balance and stand extremely well, especially for being as heavy as they are. If you can get them cheap and don't handle them too much, they can be a great shelf piece. Especially, if you have a penchant for the shiny chrome-type finish like I do. 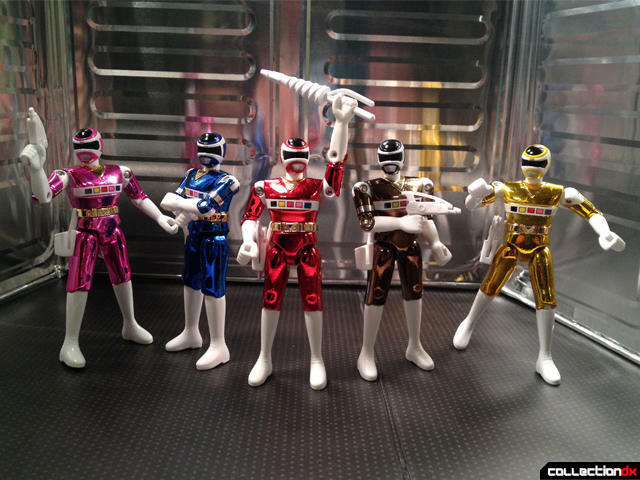 I also think they look better than the Muscle-bound Power Rangers in Space figures that were released in the US. 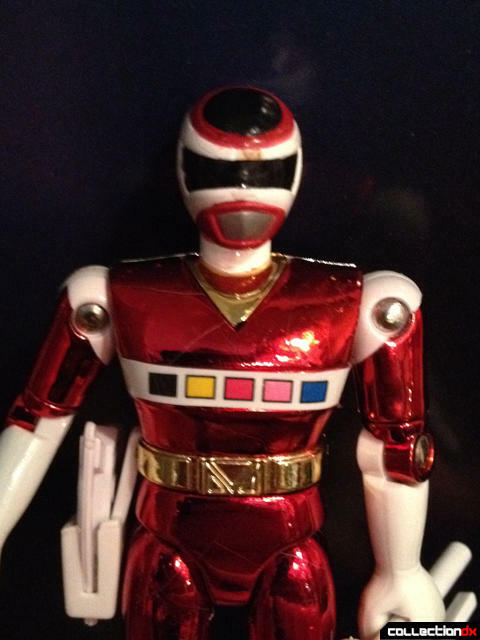 I believe the numbers are for the toy morpher from this show. 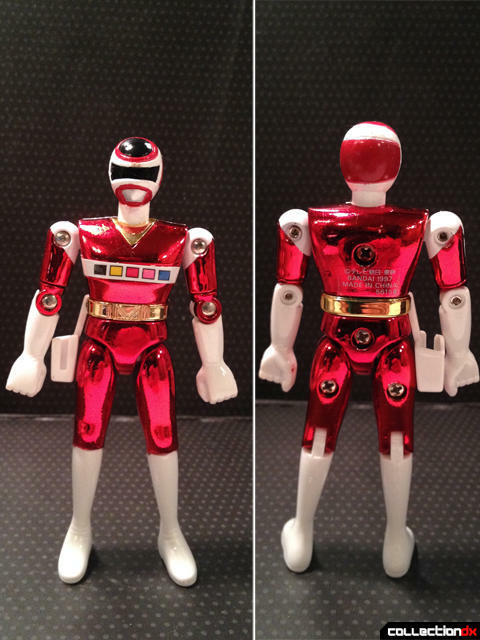 It has a little keypad on it that they use to transform so that's probably for the kids to use and become their favorite Ranger. 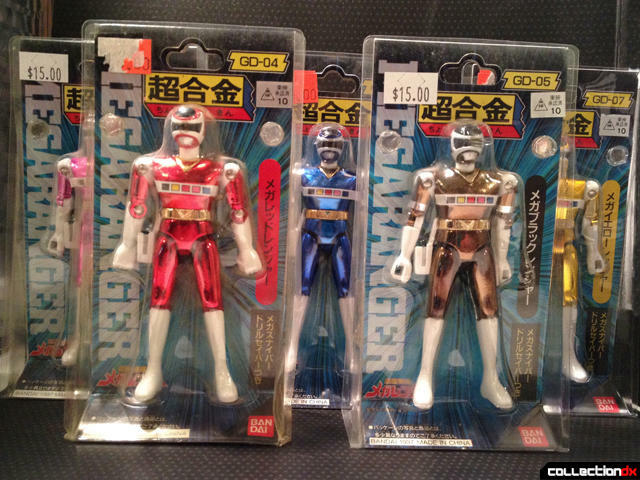 Huh, these are actually official and not knockoffs? 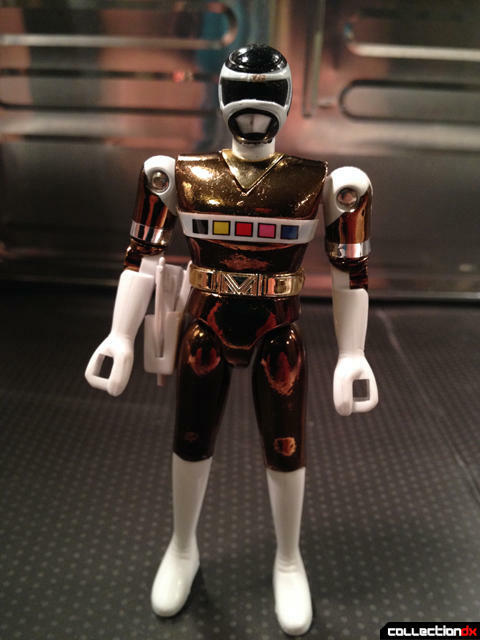 I thought they had quit making the diecast figures with Ohranger. 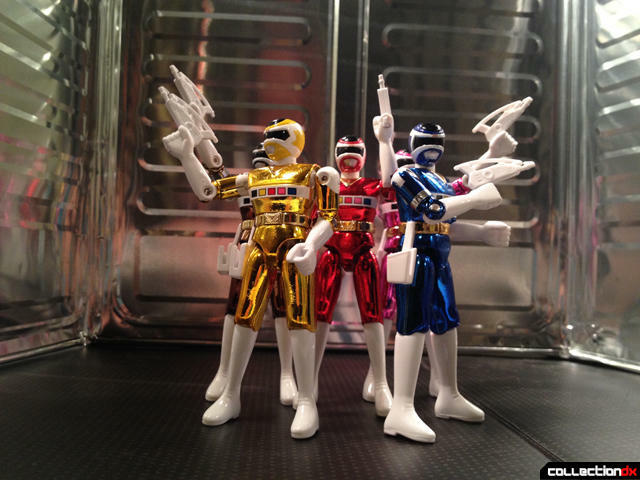 In both the US and Japanese versions of the show, the code to transform for the 5 main characters was 335. I think the numbers on the package are just godaikin designations no? 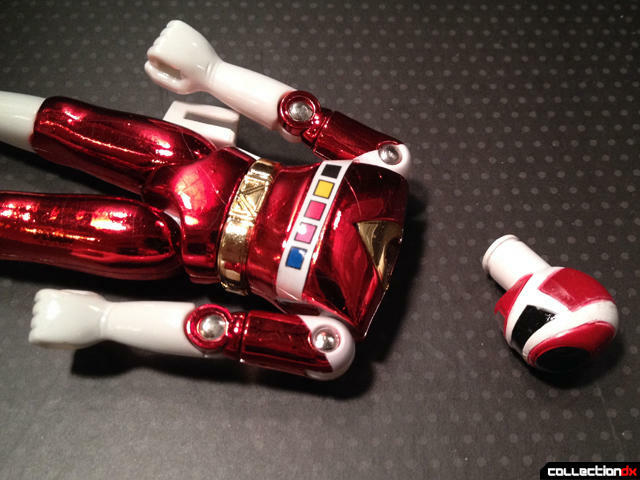 Or, do you mean the toy had an action feature different from the show that used the packaging numbers the way more recent morphers used cards and keys. 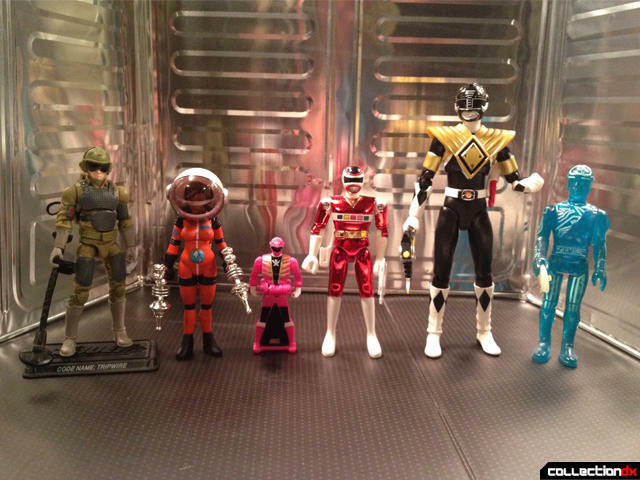 And As far as I can tell yes, these were official releases, they have the Bandai logo. 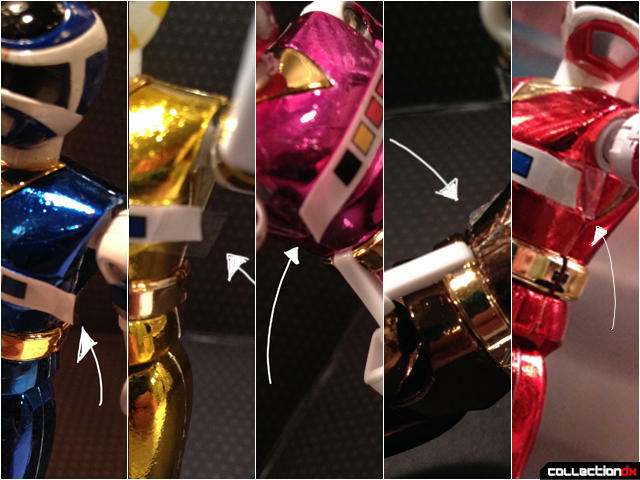 Looking at the Chogokin figures for various series, it looks likely that the same body-and-limbs toolings were re-used multiple times. 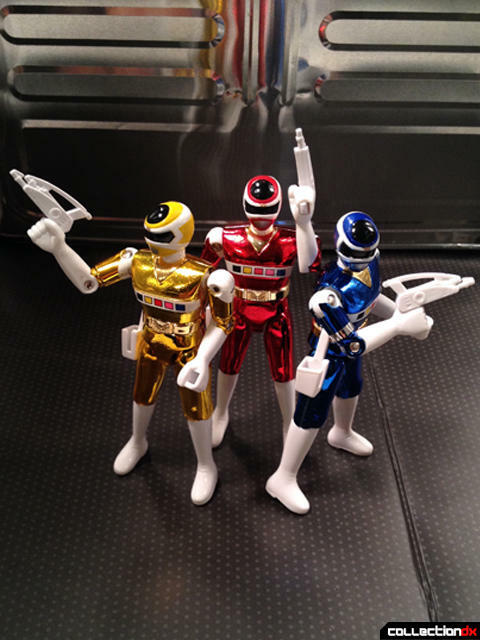 If that's the case, then it's entirely possible that by Megaranger some groups of toolings had suffered mold degredation. The flaking and cracking of the chrome says nothing about whether they're official or not. 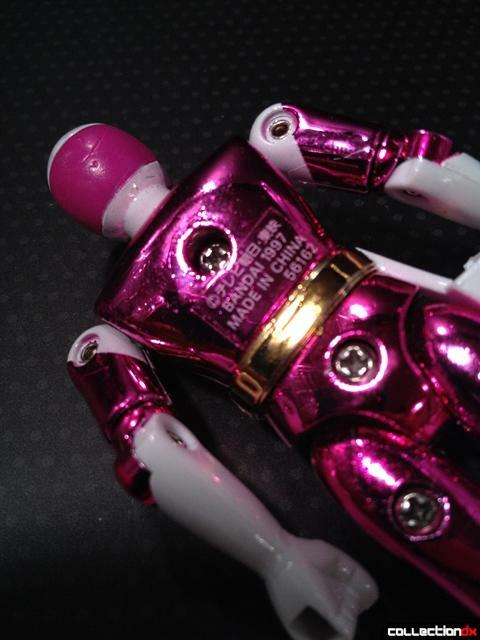 Vacuum-metallizing, which is the cheap-and-easy way to do chrome like that, often ends up vulnerable to cracking and flaking (just ask anyone who owns Beast Wars Transmetal toys).